Like many online store builders, Bigcommerce is designed to save the business owner valuable time. Daily, repetitive order and inventory control tasks can be managed with ease so owners can devote their resources to other business needs. More than just a Web builder or hosting service, Bigcommerce is an e-commerce solutions provider. According to CrunchBase, Bigcommerce is closing in on 100,000 stores and over $5 billion in transactions. Supported by those kinds of figures, the company is a major player in the e-commerce site builder game. I put the company through the paces. Bigcommerce has features for the first-time Web designer as well as advanced users. Clean templates are easy to use and fully customizable thanks to Bigcommerce’s developer tools. The SEO, analytic, and marketing products help put your business on the right path—and keep it there. The reality is that any business can benefit from the Bigcommerce site builder. A small brick-and-mortar store on Main Street that wants to reach more customers can use the Standard plan to go from downtown to the Web. Retail operations that already have a Web presence can benefit from the tools in the Plus plan. High-volume businesses can use the more personalized Enterprise plan to attract even more customers. The company has a knowledge base that supports its customers, too. I like that the Bigcommerce tutorials are crafted for users of all levels of experience. Sure, you can learn basic tasks like how to launch your store, but you can also learn how to better create customer loyalty through advanced marketing devices. The Bigcommerce wiki is another valuable resource, making the company ideal for users that like to be a part of a community. The Bigcommerce templates are clean, stylish, and functional, although not terribly unique. The free templates are very similar to competitors’ free selections; I certainly would not choose the company based on the template offerings. Paid Bigcommerce themes do have more features and less of a cookie-cutter feel, which is refreshing. If I am going to pay for something, I want it to stand out a little bit. An easy way to add some sprinkles to one of the free cookies is to utilize some Bigcommerce plugins. There are almost 100 free apps and integrations for tasks such email marketing and shipping refunds. One thing that you won’t see is a blog template, though. For that, you would have to use a plugin to sync a blog into your store’s content. For example, you could connect your blog to your website--WordPress and Bigcommerce are compatible. The basic functionality of Bigcommerce is quite simplistic, though the amount of features makes it appear more daunting than it actually is. I would not say that it was difficult for me to set up my store; it was rather easy, if time-consuming. That is not a bad thing in this case. There are plenty of details you can add about your products and customers that will make things much more organized and easier to use down the road. With one Bigcommerce login, I was able to access my dashboard, where I could work with my inventory, customer database, marketing devices, and analytical tools. For someone setting up an online store for the first time, the Bigcommerce control panel may seem overwhelming. I can appreciate that. I would suggest, though, that there are just a lot of features available to use. I was searching around to see if there were more advanced things I could get into and how easy it would be to do it. With the help of the Bigcommerce forum where users can share and find tips, I was able to learn how to use the Bigcommerce stores API to build apps, integrate a sitemap for my page, and some other back-end admin tasks. These were not easy things for a beginner to do. That said, the help was there to accomplish them. For the basic hosting and store builder packages, Bigcommerce’s pricing is straightforward. The Standard plan is $29.95 per month and the Plus plan is $79.95. Customers paying annually save 10 percent on those two plans. All plans include Bigcommerce’s POS and unlimited storage and bandwidth, as well as unrestricted inventory sizes. Bigcommerce Enterprise is the company’s customized service designed to support high-volume businesses. Because this premium service is tailored for each individual business, the price will vary by customer. Some of the many added benefits of the Enterprise plan are a dedicated account manager for priority service, advanced reporting tools, and maximized SEO. I didn’t come across any complaints about its pricing. Like most hosting companies, recurring billing keeps the lights on in your online store, so to speak; any complaints about that would seemingly be unwarranted. Any downtime due to a missed payment is the fault of the store owner, not the provider. Recurring billing helps to ensure zero downtime. Pricing for other options, tools, and features such as templates, plugins, Web design, and partner services can be found on the company’s Web page. One of the aspects I really liked about this company is its mobile capabilities. Bigcommerce offers mobile responsive templates on all of its store themes. You don’t have to settle for a look that you don’t like to get the mobile responsiveness that you need. Plus, Bigcommerce’s integration capabilities allow you to seamlessly include apps and plugins on your mobile store site, as well. On the admin side of things, you can install an app on your phone that lets you keep tabs on orders, sales, and inventory. Customers benefit from a mobile responsive storefront and you benefit from a mobile management tool. Unfortunately, I cannot say the same for some of Bigcommerce’s competitors. E-commerce is where the rubber hits the road for companies such as Bigcommerce. For this review, I focused on areas in which Bigcommerce is doing something a little differently than its competition. One thing that immediately jumps out is the Bigcommerce payment gateway option. With one-click installs, mobile optimization, and international capabilities, store owners have dozens of payment technologies available to them. Some of these are included in the Standard plan, some cost extra, and others are free or paid apps or plugins. Speaking of apps and plugins, I was able to find some cost-saving tools for shipping, too. On the dashboard, there are three different Bigcommerce shipping settings: a free shipping option and two flat rate options. With the add-ons, you are not limited to those three. You can customize the charges by using an app that will calculate shipping rates based on weight. Other resources, like the Bigcommerce University video knowledge base, the e-commerce experts blog, and most of the premium features included with the Enterprise plan are designed specifically to maximize your online store’s business. 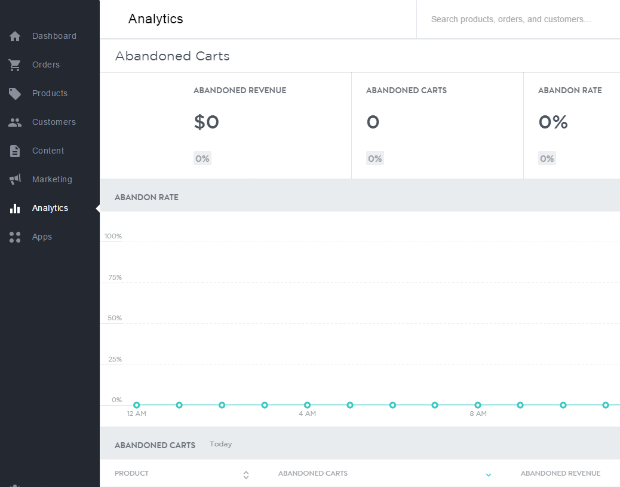 The Bigcommerce Analytics package in the store’s dashboard gives owners access to merchandising and marketing tools, real-time activity, and even the ability to recover abandoned shopping carts. Cost: Enterprise plans can be very expensive for a small-business owners. No Back Orders: You can only sell what you have in stock. The Bigcommerce support system for its users is expansive, to say the least. The company has a strong customer focus and offers a resource center loaded with articles, guides, and videos. 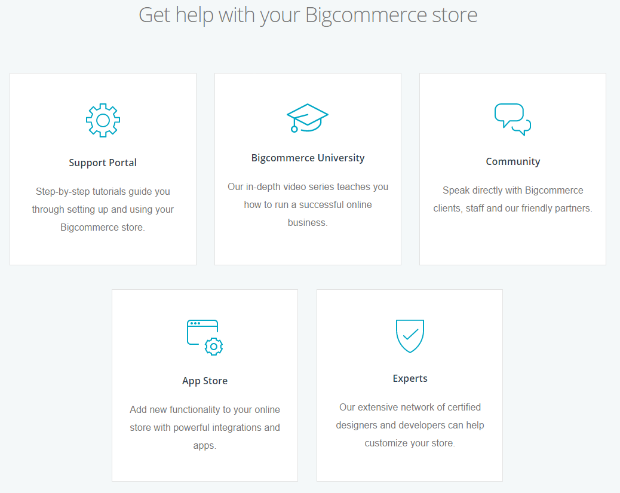 This knowledge base includes the Bigcommerce University video tutorial page, a support portal, and a community forum. There is even a spot where design and development experts from Bigcommerce help you customize your store. Aside from the static resource center, users can reach customer service 24/7 by phone, email, or live chat. I have not been able to determine if the live help is 100 percent U.S.-based or if some of it is outsourced. Some reviews claim that the Bigcommerce live chat may or may not be headquartered in the United States. In addition to chat and email help, the Bigcommerce contact section of the support page has a link to the community forum and a place create a help ticket. There are some effective SEO tools and practices. However, the full create an online shopBigcommerce SEO package is only included with the Enterprise plan. That said, if you do opt for the Enterprise plan, you will enjoy built-in search engine ranking signals like site-wide HTTPS (one of Google’s favorites). Some of the other SEO devices are search-friendly architecture, unlimited categories, automatic sitemaps, and customized URLs, titles, header tags, and metadata. All of these things make it easier for search engines to find your site, resulting in higher rankings. Another nice SEO feature I like is with Bigcommerce, related products can be linked together. In my store, I was able to group complementary items together, thereby maximizing revenue. Think about how the grocery store puts the soda next to the snack foods, or how some have deals on salsa so you buy more corn ships. With a keen focus on e-commerce, Bigcommerce’s hosting features are designed to build, protect, and optimize your online store. New users can create their own domain or migrate one from a previous provider. Once set up, store owners can control the hierarchy of their domain and sub-domains with Bigcommerce’s nameservers. The very nature of an online store demands security in a number of different areas. The company follows standard FTP guidelines, making inventory control safe—especially adding new products and images. Even more important is the protection of customers’ credit card and personal information. Bigcommerce’s SSL certification keeps all of that data guarded and intact. For the most part, Bigcommerce’s email tools and options are on par with the competition. I was easily able to connect my store email to my personal email account with the Bigcommerce webmail settings. If I am on the go, all of my customers’ emails will appear in my personal email inbox. One email option that I really liked is more of an ecommerce tool as opposed to an administrative device. You can use templates to create emails, and then send those out to market to your customers. For example, if a customer abandons their shopping cart, the software can automatically send an email to that customer containing special offers for those abandoned items. For the most part, the Bigcommerce reviews I read are positive across the board. There are some dings here and there for pricing, transaction fees, and very nitpicky SEO complaints. Other than that, users tend to like the e-commerce features and tools, such as product-promotion apps and social media plugins that can be integrated into the online store. Functionality, ease of use, and the knowledge base get high scores, as do the SEO benefits of the Enterprise plan. 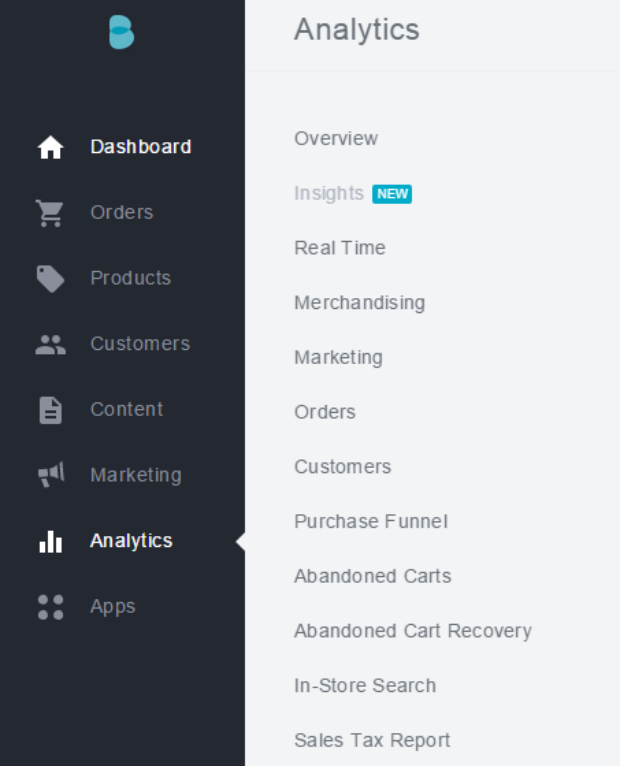 If you want to play around with the store builder, I recommend checking out the Bigcommerce free trial. For 15 days, you can create an online shop, add products, customize the look, change themes, set up a customer database, and use the analytic tools. Test users get an access code to the live version of the site. I was able to give that to my friends so they could shop, poke around, and critique. The company does not offer coupons or discount codes. The only price reduction that is available is saving 10 percent on the Standard and Plus plans if you pay for the full year in advance. Other than that, I suggest doing the free trial to see if Bigcommerce will work for you. Bigcommerce offers an impressive set of tools and services for users to create their online store. With a full-featured dashboard backed by strong e-commerce, marketing, and SEO capabilities, this company is easy to recommend to most small- to medium-sized business owners. There is a tipping point, though. Compared to the Plus plan ($79.95/month), the Standard plan ($29.95/month) does not have significant value, especially when you have to pay the 1.5 percent transaction fee for every purchase. If you are on the Standard plan, you start throwing money away if you bring in more than $3,333.33 in sales a month. For a high-volume online retailer, Bigcommerce is a legitimate option. Smaller business owners should do some math before making a switch.